In terms of clinical initiatives, one of the biggest lessons learned is that systems should always be tried in one’s real-world setting before setting too many expectations. It is imperative to try something and validate it within one’s own internal department, network, and parameters before accepting a product as it has been marketed. This would also be a fair conclusion for all three of those initiatives. When it comes to primary diagnosis in digital pathology, to have real-life clinical operational use requires a system that is equally or more efficient than the current standard, which is diagnosing patient slides on a traditional bright-field microscope. We recently put together an equivalency and efficiency study. Pure diagnostic time is probably about 19 – 20% slower diagnosing slides digitally on the computer compared to looking at them using a microscope. There are many parameters that affect that, but this is a call to the vendors to create efficiencies around the diagnostic reporting as well as all the other upstream and downstream tasks. Although data needs to be produced regarding potential efficiency gains of the entire laboratory workflow, from specimen receipt through to the time of all reporting elements. I think there is potential for significant efficiency gains from digital pathology. However, I don’t currently have the data to support that or a good example of that being implemented because – at least in the USA – there are very few centres that are signing out primary digital pathology. Where digital pathology can help in terms of efficiency is really in the lab setting. In this context, lab technicians would not have to reconcile different physical glass slides, put them in slide trays and associate relevant paperwork. Instead, they would have a completely digital workflow from the time of specimen receipt through to tissue processing, and scan them straight out of the lab. That’s where I feel a lot of the efficiency gains can occur: from a hardware perspective before the case even gets to you. From a software perspective, there is a lot of machine learning and AI tools that either the LIS or digital pathology vendors can include in their products to create more efficient sign-outs. In terms of what I would like to see developed going forward, I think it’s twofold. Firstly, having the data necessary to ascertain the true gap in efficiency in terms of complete end-to-end implementation. Is the time saving at the time of case reconciliation enough to offset the total diagnostic time, beginning from the point of specimen accession through to finalisation of the final report? Those are the start and endpoint needing assessment at to see what the true gap is. Secondly, if there is a significant gap then how can vendors improve their machine learning tools? There needs to be better interoperability between the vendors and the current LISs available. Unfortunately, I feel like that’s always somewhat of a crux. As pathologists, we report and live in our LIS, and for a LIS-centric environment there needs to be better communication, interfacing or interoperability so that we don’t have multiple systems that don’t communicate with each other. Having these types of software communicating with each other, either with APIs or some other interface, is really what will drive adoption and increase efficiency. When it comes to improving laboratory workflow and efficiency, a lot of the hardware vendors are moving through this space. However, to date, there still isn’t clinical grade hardware that can sit in the laboratory. All the necessary equipment needs to be right next to each other in the lab, or even better integrated into one machine that can perform all processes: staining, coverslipping, scanning immediately and then the updated software will have a notification system for the pathologist, enabling them to go through their work list efficiently. There’s just a lot of inefficiencies in current workflows for these processes. Currently, most laboratories have scanning rooms filled with hardware and somebody must check the slides over. I would love to see an LIS for the modern age of digital pathology. The corollary to that is an upgrade to the current LISs that are generally outdated for digital pathology workflow. I’m most excited at the potential for interoperability, as there is still not a unified whole slide image format or transfer protocol. There are a lot of workarounds currently, but I’m excited at the potential for a unified format, whether that’s DICOM or something else. I think this would be a gateway to open a lot of opportunity for collaboration, interoperability, and real clinical-grade machine-learning tools. I think that would be one of the most exciting work products for the near future. 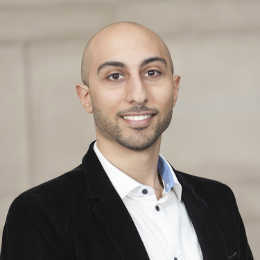 Matthew Hanna is a clinical Instructor at Memorial Sloan Kettering Cancer Centre. We are looking forward to welcoming him to the 5th Digital Pathology & AI Congress: USA. The agenda for the 5th Digital Pathology & AI Congress: USA is available to download here. Don’t miss the unique opportunity to learn from experts in the new and exciting field of medicine. Great write up and lessons for pathology lab digital pathology intervention. Have you evaluated smaller DUAL system that are LIVE remote microscopy and low throughput scanners? Same immediate results without the workflow disruption. A great research paper is needed for comparisons to full WSI.